Classic scroll design in silver over beautiful white porcelain. The size options include a porcelain toothbrush holder, tumbler, soap dish, soap or lotion dispenser and porcelain toilet brush set. 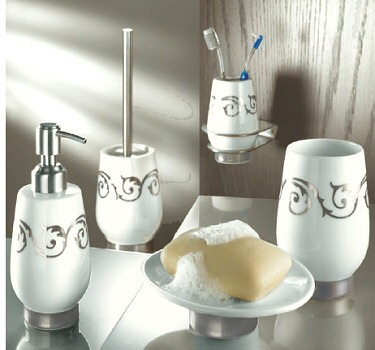 Each piece is decorated with the classic scroll design with coordinated silver base. Designed and produced by well-known German brand Kleine Wolke, established in 1968, and is backed by their quality guarantee.. Limited quantities.